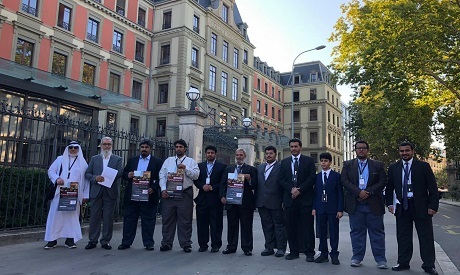 Members of Qatar's Al-Ghufran tribe organized a protest on Tuesday in front of the UN headquarters in Geneva, calling upon the international community to take action against the regime's crimes committed against them. Al-Ghufran, one of the largest tribes in the small Gulf country, slammed Tamim bin Hamad Al Thani's regime for violating international agreements by torturing and forcefully displacing its members and depriving them of their Qatari nationality. Hamad Khaled Al-Merry, one of the protesters, said the tribe has "a purely humanitarian, not political, problem" with the Qatari regime. "We came here today to present our case before the United Nations Human Rights Council," said Al-Merry. "Our demands are precise; the Qatari regime must be held accountable for its crimes against us, as they would against any other Qatari citizen, and restore our stolen rights." The protest coincides with the 39th session of the Office of the United Nations High Commissioner for Human Rights (OHCHR), which started on 10 September and will conclud by 28 September. An Al-Ghufran delegation met with Mohamed Al-Nsour, chief of the OHCHR Middle East and North Africa Section, earlier on Monday in Geneva, handing him a letter that detailed the tribe's sufferings since 1996. The letter cited the regime's "barbaric crimes" against the tribe, such as banning its members from returning to Qatar, racial discrimination, forceful displacement, and torture. The delegation said that those who are banned from returning to their homeland are living in villages and deserts that are located on the borders with neighbouring countries to Qatar. The letter claimed that the alleged victims suffered "psychological disorders" and that some of them died in the "Qatari intelligence prisons." Qatari officials were also accused in the letter of "hiding facts" in a "deliberate, ruthless and harmful manner" to prevent "transparent humanitarian organizations" from knowing the truth. The document emphasised that the regime is using an "intimidation" approach against those who are in Qatar in an attempt to stop complaints or citizens from contacting the international humanitarian bodies. It stated that the security institutions in Qatar are surveilling Al-Ghufran members who call for their rights through the National Human Rights Committee. The Al-Ghufran delegation revealed that they have evidence of these violations and that they "fear for our people in Qatar" as state authorities "continue to rely on brutal practices" and disregard "human dignity." The delegation said that authorities are hiding evidence about their crimes by taking advantage of the absence of "awareness about legal rights and free, local TV channels", adding that there is no chance for the persons who suffered these crimes to find justice through the Qatari court system. The Al-Ghufran delegation announced they had previously submitted a petition to the OHCHR about the situation on 21 September, 2017. Al-Nsour expressed "regret" that Qatar's emir, premier, attorney general, top security officials and head of the National Human Rights Committee are aware of the "racial discrimination" that Al-Ghufran tribe is suffering from.